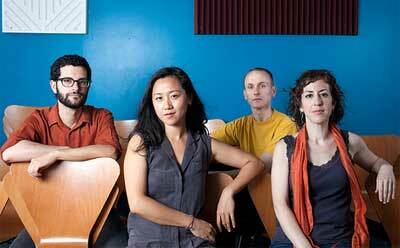 The NIU School of Music’s New Music Ensemble, under the direction of Gregory Beyer, will be joined in November by New York City-based ensemble Yarn/Wire. The groups will present two programs of music by major composers of the 20th century. This multi-day event scheduled for Tuesday, Nov. 1, and Wednesday, Nov. 2, will be the second festival in the ensemble’s history. The first took place in the spring of 2010, when another New York City-based collective, Wet Ink came to the School of Music. 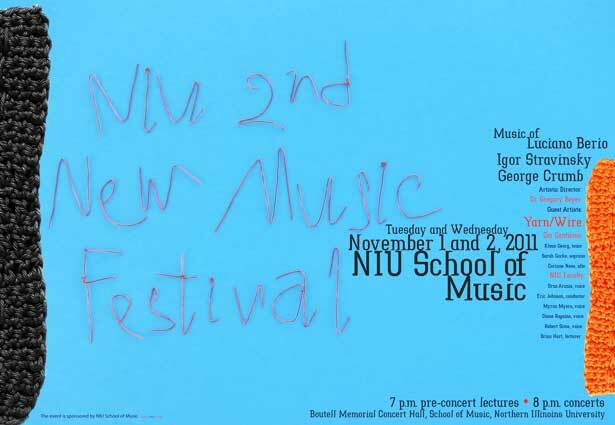 Created in 2008 by Beyer, the Northern Illinois University New Music Ensemble is a performance group dedicated to historically groundbreaking music of the 20th century and the emerging musical voices of the 21st century. With its flexible instrumentation allowing it to present diverse repertoire, it mounts concerts of works by a single composer (or collection of related/connected composers) to expose students to the wide range of musical expression that is avant-garde music making. Yarn/Wire features an ensemble of two pianos and two percussionists, an “unlikely” ensemble that nevertheless boasts a repertoire of amazing depth and history. This semester’s programs were designed around Yarn/Wire and feature music by Luciano Berio (1925-2003), Igor Stravinsky (1882-1971) and George Crumb (b. 1929). Both Berio and Crumb have written masterworks for the two piano/two percussion combination. The inclusion of Stravinsky’s masterwork from his early period, “Les Noces” (1914-1917) is a special “not-so-new” musical treat that rounds out the two spectacular programs, as it involves four pianos, six percussionists, a concert choir and four vocal soloists. to work so closely on such a large undertaking. No less than six members of the School of Music Faculty, including the entire vocal faculty, will present their musical talents on these programs. Additional guest musicians include Cor Cantiamo, a professional choir directed by NIU choral studies professor Eric A. Johnson and consisting of several outstanding NIU alumni; as well as three vocal instructors from Carthage College in Wisconsin: Corinne Ness (NIU alumna), Sarah Gorke and Klaus Georg. Preceding each 8 p.m. concert is a pre-concert lecture offered by Brian Hart, NIU associate professor of music history. Hart has additionally written program notes that will accompany each concert. These lectures begin at 7 p.m., and will allow members of the audience to listen to a detailed and lively historical account of the major works on the program and the composers who wrote them. In an ongoing collaboration inside the College of Visual and Performing Arts, School of Art associate professor Aleksandra Giza has created another poster for this pair of concerts. Copies of this poster will be signed by the artists and available for purchase at the concert. Both pairs of 7 p.m. lectures and 8 p.m. concerts are being held in the School of Music’s Boutell Memorial Concert Hall. All events are free and open to the public, and the auditorium is accessible to all. For more information, contact Beyer at (815) 753-7981 or gbeyer@niu.edu.